Welcome to the Fall 2017 edition of the “One Room Challenge”! 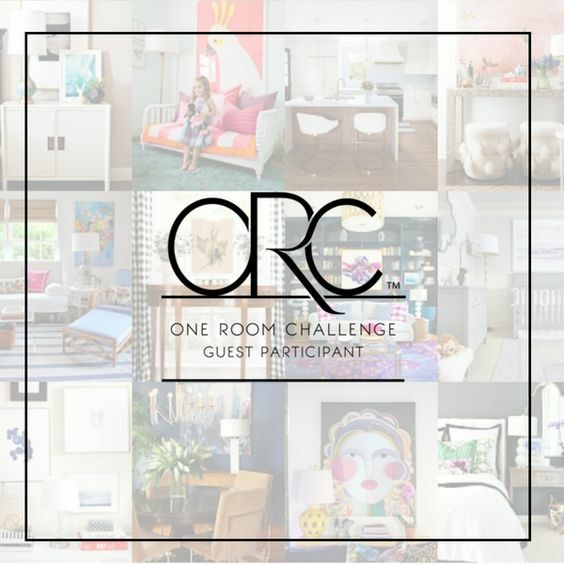 Currently in its 12th season, the One Room Challenge™ is a widely anticipated biannual event every April and October. Each round, twenty design bloggers take the challenge and transform a space. Every Wednesday, the designers document their process while sharing their sources and professional advice over six weekly posts. This spectacular event is hosted by the lovely Linda at “Calling it Home” HERE. Last year, I participated in the “One Room Challenge” as a guest participant, and showcased our master bedroom remodel, read about that HERE. Since then, we have moved to another home. In our new home, I have already taken on several renovations and projects, many of which are highlighted on my blog. This season, I am once again a guest participant in the “One Room Challenge”. I will post updates to my renovation project every Thursday for 6 weeks and post the final reveal on Week 6. I have decided to take on our kitchen as my renovation project for this event. I have struggled with this space since we moved in, and it is going to be a big challenge for me. So stay tuned! Here are a few before pictures of the kitchen space that I will be transforming. As you can see the space is enormous, making it even more challenging. My design inspiration for the kitchen is to create a white and bright space like the photo below. I’ve got my work cut out for me, don’t you think? In the above photo, I really like the blue island with the travertine floors. My plan is to paint one of the islands a pale blue. To get weekly updates on the kitchen renovation, subscribe and follow the blog. You can also follow along on Instagram HERE. White paint will go a long way toward achieving your goals! It will be great. Thanks Connie you’re right. Now just choosing the right white paint will be tricky since there are hundreds! UGH…. Hi Lydia! Me too! Thanks for stopping by. Such a large space! Love your inspiration photos — can’t wait to see how it comes along! No doubt you’re going to have fun with this! So excited to see how it all comes together! I certainly will! I’m a bit anxious about it too…but am confident it will all come together in the end. The kitchen is massive. I love the new ideas of the cupboards, they are my kind of. But the island in the middle of the kitchen is my no no. I am not a fan of kitchen islands, I think they occupy space. My idea of making my future kitchen is to find an old rusty french farmhouse table and just lay it in the middle as my kitchen island. Simply I think something old always attack the new bright design and I believe it makes it well to live together with the new style. And since I am thinking of buying a home, if ever I buy a house with an island in the mid of the kitchen, I will definitely remove it and either sell it. But then on it is a nice thing for others, and I think it does make a great asset in the kitchen for those who loves them. What a before to start with! I love the idea of a blue island! Looking forward to following along! This room is HUGE! Wow, good luck. Looks like fun. I am in the process of renovating a small old house. It’s has been and interesting project. The whole house would probably fit in your kitchen. Can’t wait to see your progress. Fun is one way to describe it 🙂 The painting is taking longer than I anticipated, but there is satisfaction in doing the work yourself. Thanks for stopping in, I’ll have to stop by and see what you’re up to as well. Thanks just starting out blogging have not posted anything yet. But will soon. Just trying to get comfortable with everything first. It definitely takes time. You will grow and change as the months pass, always learning new things. I have been blogging for almost a year now and continue to learn something new everyday.